my Barra is the Outreach & Education Coordinator with the Center for Inland Bays. Originally from the Adirondack Mountains in NY, Amy completed her Bachelors in Environmental Studies and Education at Green Mountain College in Vermont. 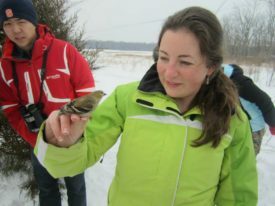 She then went on to complete her Masters of Science through Lesley University’s Ecological Teaching and Learning program in Cobscook Bay, Maine and Cambridge, Massachusetts. Prior to her work at the CIB she held education & outreach positions with Cornell Cooperative Extension, National Audubon Society and NASA’s Wallops Flight Facility Visitor Center. In the course of this work she’s recycled tons of hazardous waste, tagged Short-Eared Owls, run hundreds of educational programs, and designed a rocket engineering exhibit, among other interesting projects. Although she occasionally misses the mountains and lakes of NY, she is thrilled about the mild winters on Delmarva and the close proximity to the ocean. In her spare time, she can be found organizing alumni events for Green Mountain College, serving on local committees or exploring the Shore with her dogs.